Seems they stopped the 1.7 rollout since a lot of players cannot login the game after they updated. Still take advantage... Because when update becomes widespread, it will be patched. so to hack stabilizer you have to buy one first, right? @NoFear any way to hack bropoints & trial medals bro? Can I know what do 41 and 2000 mean please? You guys going to get all of us banned from the game ???? one click = 9100 crystals. No need for bro points or medals since you have a 100k crystal in your account ? But the answer is no hack for any of them yet. The same happens to me. 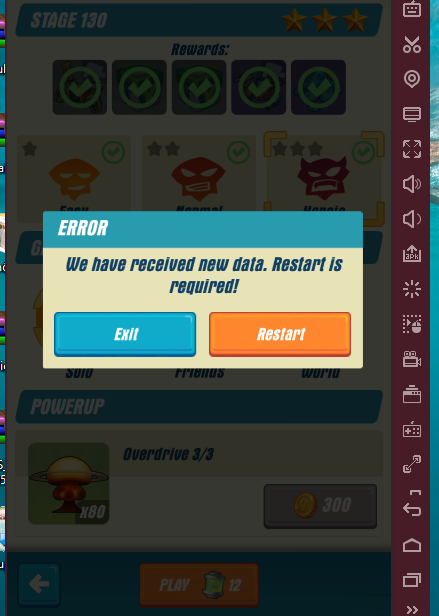 How can i fix that? This is happening because you're copying the wrong value and paste it to the 300 value. It's the range of how many bytes are in between each value that is being searched. That's what I've always thought anyway. If you manage to find these three addresses, and calculate for example the offset of the address of 300 and 9100, it amounts to 52C which when converted amounts to 1324. 1324 is how far away the address of 9100 to 300.
also search 300;9100::1325... it showed 4 addresses for me but just by checking the address structure and pointer I'm still able to find the right values out of the four. No. You don't have to buy any. You must do things in proper order. Or you get a sync error. The 15470 and 9100 crystals inapp. You can only buy the 15470 1 time ,that's it . You can't buy 9100 until the 15470 has been purchased. It would would be like trying to hack the level of you plane or brobot, can't skip from level 1 to 80. Has to go through every level. Either you messed up (not proper order) or wrong values. Dword to dword = 4 so min range between dword is 4+1. Line 1 to line 3 would be 8+1. Always +1 to the range. What your version of hawk? @NoFear Was the video based on 1.7? Thanks.